With vast industry knowledge, we are presenting a high quality range of Brass Hex Nut. The nut has six sides and is used in conjunction with screws and bolts to hold items in place securely. We manufacture this nut at our sound production unit using best quality brass, sourced from reputed vendors. This nut is a type of hardware that fastens one item to another. 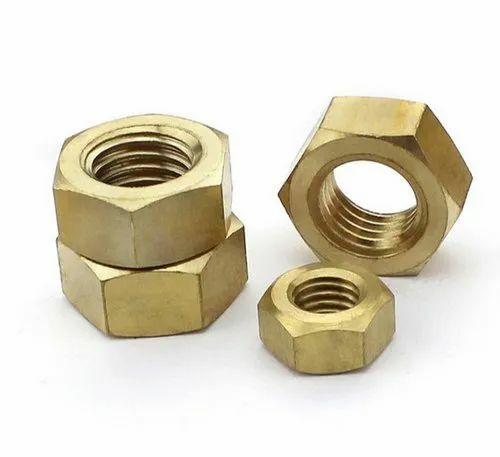 Brass Hex Nut is available in different sizes and specifications as per client's requirements. We offer this nut at affordable prices. We are pleased to introduce our self as RATHOD INDUSTRIES SINCE 1974. Leader in manufacturing of domestic & Export Brass Transformer Bushing Metal Parts & Brass Energy Meter Components in India. Giving our customer a technological advantage has always been one of our company primary concerns. We are continuously working on new products improvement to guarantee our customer receive the best components in the Indian market. Brass Inserts & Moulding Inserts.